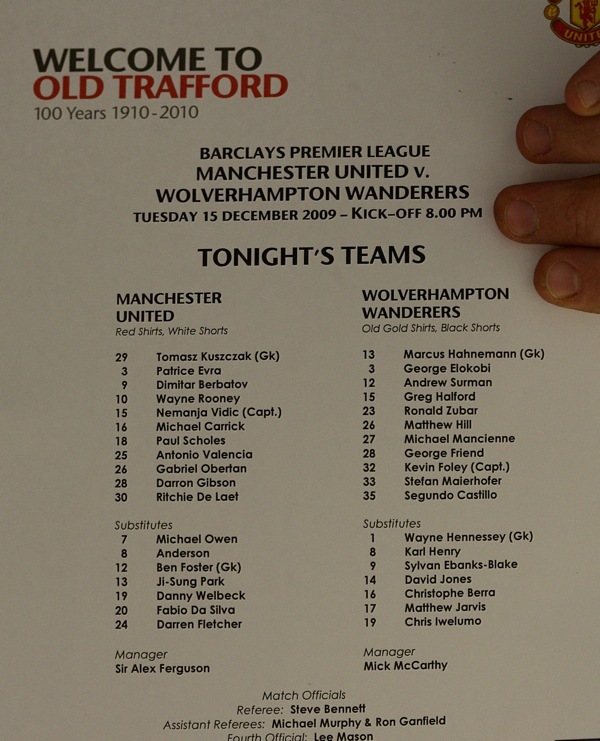 Mick McCarthy fielded a weakened XI at Old Trafford last night, resting some ten first-team players. Man Yoo played quite poorly but won easily. Therefore McCarthy has been found guilty – by the kneejerk media, at least – of bringing the game into disrepute (there’s plenty of disrepute in journalism also, disrepute fans), of disrespecting the Premier League, of being Satan’s little helper, of being a BA cabin-crew member; you name it. “I’m not bothered about angry reactions anywhere else, my priority is my own team and any decisions I make this season will be based on whether or not we can stay in the Premier League. Whilst the reaction to McCarthy’s selection has been over the top, and it’s my natural incliation to side with the underdog, I think there’s no way to defend him on this one – he blatantly put out a weaker XI, presumably with this weekend’s winnable fixture against Burnley in mind. The irony is, had Wolves’ first XI played at Old Trafford last night, they might well have been good enough to sneak a point, or more – the Theatre of Dreams has hardly been a fortress this season, after all. Fair enough, but as much as the big four might rest players in the League Cup, in the Prem it’s required that you field as strong a team as possible. Clearly, Wolves did not do that last night. But, as Paul Wilson rightly points out in the Guardian, in modern football, the concept of a first XI is outdated anyway. And who are we to judge the fitness levels and form of McCarthy’s players. In ice hockey, for example, teams are rotated frequently, even during matches. Fans don’t care, as long as the players on the ice give their best. The same should go for football. It’s about managing resources, and for Wolves, it’s all about staying in the top flight. So I hope the authorities go easy on Mick. Indeed, you might even make a case for blaming the Premier League’s fear-engendering effect on English football, which means that all but a handful of Prem teams are concerned solely with survival and the money it brings. I feel slightly sorry for Wolves fans who travelled to OT full of belief after the win at Spurs, but at the end of the day (Brian), it’s about supporting whichever team is put out wearing your colours. And how many times have fans of smaller clubs been disappointed by under-strength teams fielded by the big boys in cup competitions? McCarthy’s selection sent the message: this is what the Prem reduces managers to. And, as we all know, you don’t shoot the messenger. Manchester United's Danny Welbeck rues a missed chance to score. As a United fan, I’d like to point out that if he didn’t rest players last night, then he wouldn’t have been able to fulfil his obligations by fielding his full strength first XI at the weekend. In one of the games he had to rest his first team, who is to judge when the manager of a team should do that? I’m a United fan as well, and I was disappointed for the Wolves fans that made the trip. That said, it’s the manager’s prerogative to field whatever team he thinks is best. So-called big clubs regularly field weakened sides against weaker opposition, and even when points are dropped, there’s no witch hunt afterward. It may have been cynical on McCarthy’s part, and lord knows there’ll be another almighty fuss if he fails to beat Burnley on the weekend, but he rightly saw it as a chance to preserve the freshness and morale of his first choice team for a more winnable game. Every team in the Premier League has to rotate players at some point, and for a newly-promoted team, a trip to Old Trafford isn’t a bad place to do that. It’s also worth noting that McCarthy already played a full-strength team against United this season, in the Carling Cup. And they got turned over quite easily by our reserves. If you thought that Wolves first team that got beaten by ‘United reserves’ in the ‘worthless cup’ you didn’t read the team sheet. Mick McCarthy in ‘Selecting Wolves Players’ controversy. I always thought that rule about having to field a full strength team simply meant you had to field 11 players. Reminds me of Wenger lol!